During the recent rocket attack from the Gaza Strip, the Army of the Nation, an organization affiliated with Al-Qaeda, claimed responsibility for rocket fire targeting the western Negev and Ashqelon. (Islamic forums website www.muslim.net , November 1). The Army of the Nation firing rockets at the city of Ashqelon from a site near a cemetery, November 14 (Hamas’s PALDF Forum, November 17). Note : On November 14 a number of rockets were launched at the Ashqelon region. 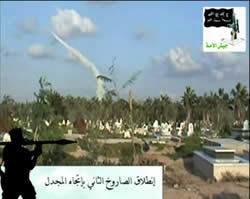 Responsibility was claimed by Hamas’s Izz al-Din al-Qassam Brigades (Izz al-Din al-Qassam Brigades website, November 14). 2. To the Army of the Nation’s announcement was appended a video clip documenting the rocket fire, which was carried out from a site near a cemetery. 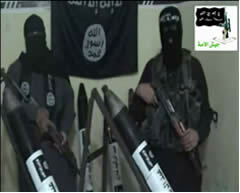 The clip featured two masked Army operatives surrounded by rockets and other weapons. The rockets were inscribed "Abd al-Rashid Ghazi.” The spokesmen said that the rocket fire was part of a larger operation dedicated to Abd al-Rashid Ghazi, which would "pulverize the posts of the Jewish Nazis.” They also said that the organization did not adhere to any lull arrangement and that its operations would continue as part of " the path of the global jihad .” In the past the organization also claimed responsibility for a number of rockets fired at western Negev population centers. name of Abd al-Rashid Ghazi (Hamas’s PALDF Forum, November 17). 3. The Army of the Nation, Jerusalem was officially established in 2006 after it had been operating in secret for several years previously. It is one of a number of organizations in the Gaza Strip which have affiliated themselves with Al-Qaeda and the global jihad. It regards all Muslims as belonging to the nation of Islam and defines itself as a pure Islamic organization, and therefore does not adopt Palestinian national symbols . The addition of " Jerusalem ” to its name is apparently intended to emphasize its Islamic roots. 2 Organization operatives describe themselves as "Salafit jihadists” 3 who seek to bring the rule of Islam to the entire world. They publicly state that their objective is to kill Jews, Christians and Americans and to die as martyrs for the sake of Allah. 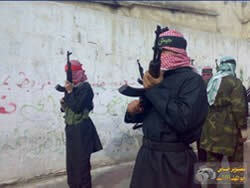 Operatives of the Army of the Nation, Jerusalem (Islamic forums website www.muslim.net , November 1). The Army of the Nation’s insignia. 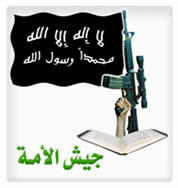 The inscription on the flag reads "There is no God but Allah and Muhammad is his prophet” (the shahadah). 4. In the year and a half since Hamas took over the Gaza Strip, there has been an increase in the volume of political and operational activities carried out by organizations affiliated with the global jihad. That is a function of the Islamization process affecting the residents of the Gaza Strip and of the Al-Qaeda’s ideological penetration into the area. Prominent among the organizations are the Army of Islam (which participated in the June 2006 abduction of Israeli soldier Gilad Shalit) and an organization calling itself " Fath al-Islam fi Ard al-Ribat, ” 4 a terrorist organization operating in Lebanon and a branch of the global jihad. It claimed responsibility for several attacks against Israel carried out from the Gaza Strip, especially rocket and mortar shell fire. 1 Abd al-Rashid Ghazi was one of the leaders of the armed men in the events which took place at the Red Mosque in Islamabad , the capital of Pakistan . He was killed there by Pakistani army forces on July 10, 2007. On July 7, 2007, he declared an Islamic revolution, following which the Pakistani army attacked the militants entrenched within the compound of the Red Mosque, known as a stronghold of radical Islam, and whose clerics supported the Taliban. More than 100 people were killed in the events. Various weapons were found in the Red Mosque, as were letters of instruction from the Al-Qaeda leadership to Ghazi and his father Mulana Abdallah, who founded the mosque (and who was killed in 1998). 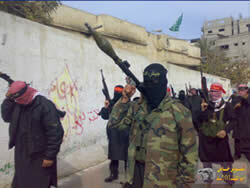 2 For further information see our February 11, 2008 Bulletin entitled "A group called "Army of the Nation, Jerusalem ” is yet another global jihad offshoot in the Gaza Strip” . 3 The Salafia is a school of Islamic thought which advocates practicing the Islamic religion as it was practiced by the first generations of Muslims, considered as role models. In recent decades the salafia has been used to describe a radical political perception adopted by extremist Islamic groups operating in the Middle East and the international arena. 4 Ard al-ribat ("the land of the frontier”) is the Islamic name for the territory known as " Palestine ,” where the Temple Mount is located, the third most important site in Islam. Since the area is governed by Israel , it is considered an area where Palestinians are the front line, whose role is to take part in the future jihad and liberate the Islamic holy places in Jerusalem .